Viewing a thread - Fantastic 60 Adventurer 4D Hardtop Survivor 34k mi; $350k??? Fantastic 60 Adventurer 4D Hardtop Survivor 34k mi; $350k??? Subject: Fantastic 60 Adventurer 4D Hardtop Survivor 34k mi; $350k??? I'm going to assume this guy meant $35,000, because as nice as it is, there's no way it's worth $350k. You could buy a handful of restored letter cars for that price. That said, this thing looks awesome if it's all original. Very clean, looks like a car that's only about 3 or 4 years old. Interesting and kind of unusual color combo, minty green on black. Interior looks incredible and supposedly the car has only 35,000 miles on it. Not really sure why we can't get a pic under the hood in the ad when we get shots that more or less duplicate other shots. Subject: RE: Fantastic 60 Adventurer 4D Hardtop Survivor 34k mi; $350k??? Location: Lower Mainland BC Mother Mopar did do Art Deco interiors but that Desoto doesn't have one. That is my old car, VERY nice unusually optioned car...worth around 30K IMHO. 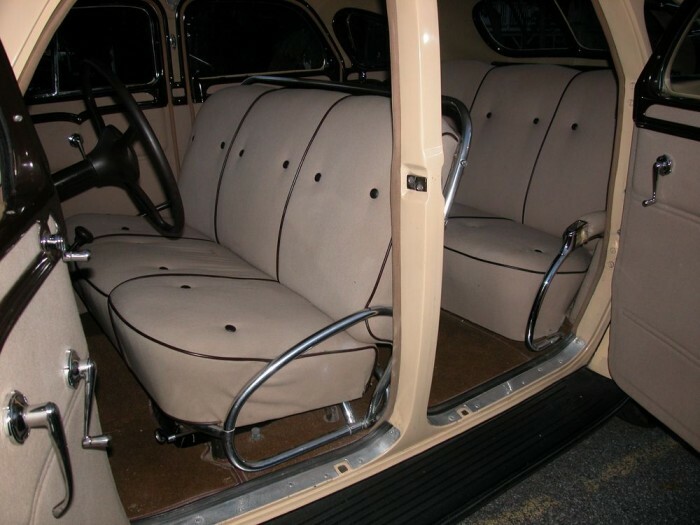 Mother Mopar did do Art Deco interiors but that Desoto doesn't have one. Location: Under the X in Texas Its $35 K now which is an appropriate asking price. Location: northern germany Weird, as US-Adventurer it should have chromeplated windshield garnish mouldings. Location: Southern Sweden - Sturkö island Are you sure Sid? Yes, they were the top models for Desoto, treated like 60 Furys. Furys got chrome, like Adventurers, New Yorkers and 300s. My 2 60 Adventurers had/have chrome garnish mouldings and these were sedans, the one above is a higher priced HT. Weird, as US-Adventurer it should have chromeplated windshield garnish mouldings. It could have been as to which plant the car was built in, or what time of the year it was built, or whether they may have been out of the chrome mouldings when this car rolled down the line. I have seen them both with and without. My US built 60 Saratoga 2 door HT had painted window sill garnish mouldings, they are now chromed ( I got them done) The mouldings above the side windows and roof bows were all stainless steel on mine. Wizard's US built 60 Saratoga came with all those same mouldings painted. ( He has now changed them all to the chrome and stainless mouldings). There never seems to be an exact truth on what may have been correct on these cars. Location: northern germany Yes, I once had a very early production 60 Adventurer, the one I have now is from late Dec. 59 and I noticed several production changes, like gauges and handbrake. That is easy, a 1934 Chrysler Airflow, may have one in my garage which helps with the ID! Nice Adventurer all the same! Is $35k reasonable for this one? Seems like a lot. I've got a 2 door 60 I'd sell for that!